Tonight I was trying to think of a photo for the day. I have had an idea to shoot off of the top of this parking garage in the levee area here at Purdue for a while. Of course you could only drive to the 4th floor so I grabbed my gear and walked up the three flights of stairs to get to the top. 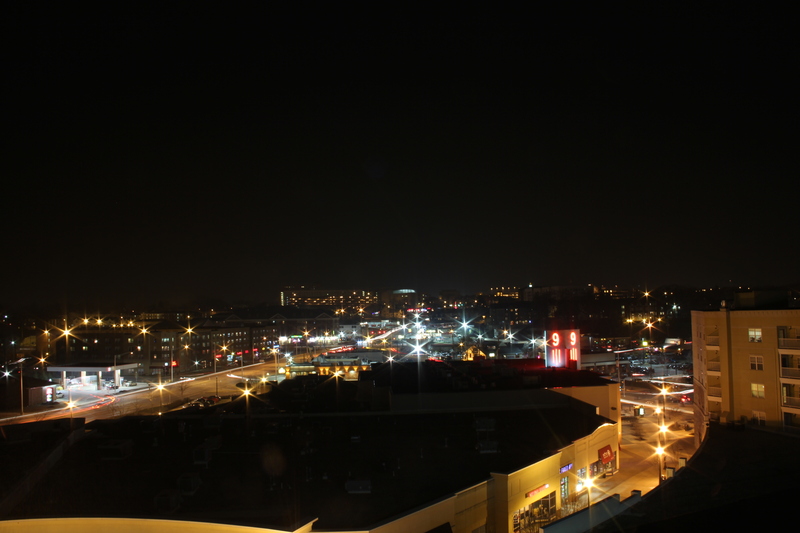 Once there I set up my tripod on the angled surface to get some pictures of the busy streets below. I thought that this would be the best view from the top of the garage. After being up high last weekend in Indy nothing could really compare, but I thought I could capture something interesting. I took my three bracketed shots as usual hoping to capture something that I could turn into an HDR shot. I dialed in my shot to get something that I liked in the viewfinder, and then clicked the shutter button. After compiling the three shots together once again I realized that I had one single shot that looked better than the three combined. I don’t put together an HDR image just to do it so I decided to show the one shot that I liked. This is a 15 second exposure that has a little going on in it. I don’t have the solid red and white streaks that are the cars going by, but I really like how the cars turning show up in this shot. You can see a car turning in and out of the Speedway on the left of the shot. This may not be the best shot of my 365 project, but it did teach me a bit. That is what the project is for so I think that it was a success. I will have a little more in the back of my head next time I find myself on top of a parking garage. I took a similar shot last night! It is so flat here that I’ve been looking for ways to get up to get some interest and perspective. I climbed a fire escape and shot away. I think there is one photo I caught that I like well enough to post, I’ll be putting it up shortly.